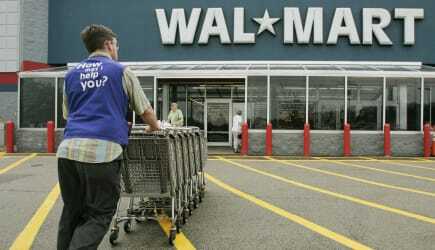 Many Walmart workers have been angry about a new uniform mandate. Even if workers make close to minimum wage, as many Walmart employees do, they will have to provide collared shirts, a departure from the past, and khaki or black trousers, and women can also choose from skirts or skorts. The company even reminded workers that they could use their 10 percent associate's discount to buy the clothing from Walmart itself. The one article that the company planned to pay for was a blue uniform vest that all store workers will have to wear. But according to information sent by the PR firm for the labor organizing group OUR Walmart, there's an irony, because Walmart, which has promoted its interest in investing in the U.S., is purchasing the vests from Jordan, in the Middle East. The group sent an image of the label to AOL Jobs. 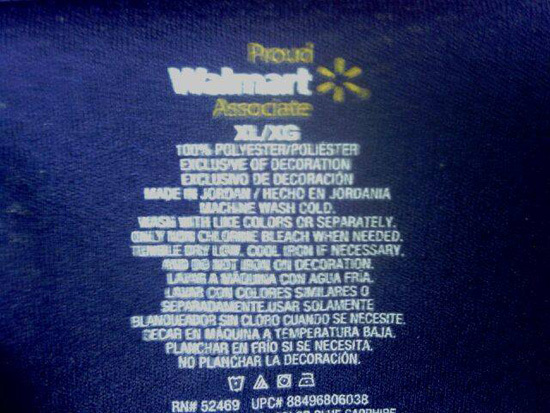 It explains that the garment is made of polyester and that it is made in Jordan. What makes this a black eye for the company is its PR campaign of investing in American jobs, in which the company says it will put an additional $250 billion over the next ten years into U.S.-made products. According to the company, the effort would consist in buying more products already sourced domestically, find "new to Walmart" products in the U.S., and "re-shore the manufacturing of goods we currently buy by facilitating and accelerating efforts of our suppliers." In its drive to lower costs, Walmart has been a force in sending manufacturing and jobs overseas in the first place. U.S. apparel manufacturing was hit particularly hard by many companies, not just Walmart, looking to benefit from low labor costs laxer safety and environmental regulations in other countries. According to the Institute for Global Labour and Human Rights, in 2011 there were allegations of human rights abuses in at least one Jordan factory that Walmart used, as the Huffington Post reported. AOL Jobs requested comments from Walmart, which did not reply before publication. We will update the story if the company does respond. We have been working for several months to identify a U.S. supplier for our new vests. We were unable to find a US supplier who could provide the number of vests we needed in the time we needed. It's been a challenging process and is one of the main reasons we've focused our efforts this year on helping textile manufactures overcome the barriers to sourcing domestically. We are excited to say that we are very close to signing an agreement with a U.S. supplier to provide our replenishment vests. In fact, going through this process is one of the reasons Walmart has focused its US Manufacturing initiative in our first year on the textile industry and supply chain. I've attached some information about the US Manufacturing Innovation Fund. The first winners were announced last month, as you can see many of the universities who were awarded funds are working on challenges related to the textile industry.